New! Sky Calls is an astronomy-based educational program, perfect for home schoolers. Check it out. 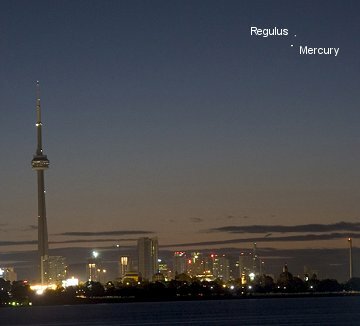 Above: At dawn on Sept. 10th, Heidi Evans snapped this picture of Mercury and the bright star Regulus, hovering together above Toronto, Canada. What's going on here? Atmospheric optics expert Les Cowley explains: "Dip a pencil in water and it looks bent. Light from it is refracted, has its direction changed, when it passes between the water and air. 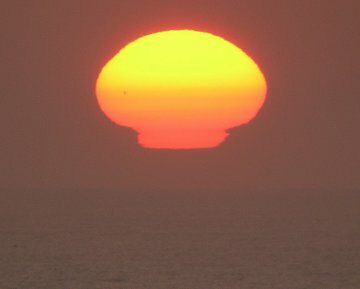 Air layers at different temperatures do the same, they create mirages and distort sunsets. A cool air layer near to the ocean and hotter layers above probably created these sun mirages." You are visitor number 32767030 since January 2000.